"Well… wow. Can't believe I've never seen this study! I'm gutted I can't get the full text… if you can, please would you send it to me! Here is a link to the full text website: LINK"
I have now got the full text and I thought I would share the technique that allowed me to get it – You can read our article on effective searching using PubMed HERE. Research like this demonstrates why the Mac-Nutrition Facebook and Twitter pages do so well because people are realising how much bad dietary advice is out there. This article is also, as the title says, just a research update; I have focused on just one area and in the future will write something more extensive on the guidelines as a whole, including the premature information on salt and cholesterol intake in particular. Instead, research like this shows just one area of how the UK Dietary Guidelines are perhaps a little premature. So, below I have given an overview of the research with a few extra comments to help explain some of the more complicated stuff. Needless to say, the easy conclusion here is; Don't increase your carbohydrate intake and reduce your fat intake thinking this is necessarily a healthy thing to do! Or more succinctly, don't follow the Dietary Guidelines. Arefhosseini et al (2009) Effect of advice to increase carbohydrate and reduce fat intake on dietary profile and plasma lipid concentrations in healthy post-menopausal women. Dietary guidelines advice: Increase carbohydrate intake and reduce fat intake. Concern: Raised blood triglycerides (TG) are a known risk factor in coronary heart disease (CHD). TGs are perhaps a stronger indicator than cholesterol levels for risk of CHD. Carbohydrate intake is generally correlated to blood TG levels. To evaluate the effect of advice to increase carbohydrate intake to 50% of energy intake as part of advice to follow current dietary guidelines on the dietary profile, including dietary glycaemic index (GI) and plasma lipids in healthy post-menopausal women. Subjects were asked to follow this diet for 4 weeks, in a free-living situation. Fasting blood samples were obtained at baseline and after 1 and 4 weeks. There was a significant decrease in body mass index (BMI) after 4 weeks [i.e. the women lost weight]. There was a significant increase in blood TG concentrations after 1 week [that’s a bad thing]. High-density lipoprotein (HDL) cholesterol concentration was significantly decreased after 1 and 4 weeks [that’s also a bad thing]. The subjects significantly increased their percentage of energy from carbohydrates and starch (p < 0.05 and p < 0.01, respectively) after 1 week, and their percentage of energy from starch after 4 weeks [So they are managing to follow the advice they have been given]. Dietary GI was significantly increased after 1 and 4 weeks [This is inevitable with increased carbohydrate intake and reduced fat intake. Even swapping butter for sweet potato will increase the dietary GI]. Fruit and vegetable intake was significantly increased after 1 week (p < 0.01), as was fruit intake alone [the advice has led to an increased fruit and vegetable intake so the increase in carbohydrate has been partly from what most would agree are good sources]. There was a significant increase in the 'antioxidant power' of blood plasma [most probably due to the increase in fruit and vegetable]. In post-menopausal women, following the UK dietary guidelines resulted in changes in the lipid profile that were more likely to favour an increased risk of coronary heart disease (CHD), as TAG concentrations were increased and HDL cholesterol concentrations were reduced. One thing to draw attention to here is the fact that the women in this study lost weight. Now, over the four weeks this means the women were most likely in a net calorie deficit and you might say they were on a 'diet' or if you feel so inclined 'a healthy eating plan to lose weight'. When weight loss occurs in your average person, whether their BMI is 22, 27 or 33, you will generally find an improvement in various health markers simply because of the weight loss and the fact that the body has been in a semi-fasted state [fasting is very good at fixing many of the negative effects of poor diet]. So, what makes this even more interesting is that these woman lost weight and got more unhealthy!? What if they followed these rules for longer, and maintained their weight!? We could almost guarantee the results would be even less favourable than seen here! Another final note, often the argument against lowering carbohydrate intake is that it will 'limit the intake of vegetables and fruit' however this is rubbish. Reducing the intake of bread, pasta and potatoes leaves plenty of room for vegetables and fruit whilst still maintaining a reduction in total carbohydrate intake. In fact, what a study that would be! 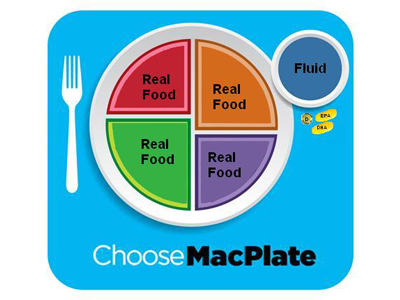 Mac-Nutrition's Methods: Subjects kept their carbohydrate intake constant but simply swapped ALL starchy carbohydrates for fruit and vegetables. We hope you have enjoyed this article and hopefully it will make people think twice about blindly following guidelines in both professional practice and daily life. Thanks for the article – not sure I got the jist of it though!! Does increasing fruit intake increase your carb intake or am I being a ditz? There was a significant increase in the ‘antioxidant power’ of blood plasma [most probably due to the increase in fruit and vegetable]. – is this bad? I am eating bare fruit and veg now due to cutting down carbs – is this a good swap? I have so many questions I could post all day!! Fruit contains carbohydrate yes. Increasing antioxidant levels due to eating more fruit and veg is probably a good thing. Sorry this wasn’t clear. I personally wouldn’t recommend HUGE intakes of fruit. Emphasise veg over fruit. You’re right, it doesn’t tell you much after 4 weeks. I’m not sure what your point is. The authors did a 4 week study to see what happened to markers of risk. Fairly transparent. Have you read the full paper? I can send it to you if you would like? They talk about alcohol consumption etc. I’m not entirely sure what difference this would make though unless you think the dietitans were telling them to drink lots of alcohol to increase their carbohydrate intake?? You’re completely right, my MSc doesn’t teach anything about how to keep people healthy… neither does a medical degree but I’m pretty sure Doctors give nutrition and health advice… and dietetics… well, we’ll leave it there. Needless to say a lot of what I do is self taught and so far the results seem to be doing the talking. I’m not sure where I’m telling HCPs what to do in this post though? I have read the paper and it is very flawed – probably why it was not reported much. I did not see it and am constantly researching the subject – so thank you for the info! I had never heard of you until I saw a post on a dabetes site – very subtle by the way pushing the yogurt! Now forgive me but are n’t you involved in a group who want to re educate HCP! What is your problem with dietitians – I would like to explore that. I am guessing you may be influenced by other people and even what happens in the US ( happen to think they are badly trained over there) – I have worked in general practice for years and what I see is a fantastic understanding of food and applying that to their patients. There are so many fantastic projects going on across the UK led by dietitians but you never hear about them. Dietetics also involves very technical applied nutrition – SCBU. IV feeding , paediatrics etc. perhaps you need to have a look at what dietitians actually do – there is so much misinformation on the net applied by people like zoe harcombe, john briffa etc . These two have absolutely no practical application – if you ask them they suggest you buy their books – that says it all to me! I teach nutrition at a University as well and teach my students about food and its application to nutrition. Doctors shouls stick to being doctors as they have no understanding of food and its realtionship to disease. I have spent years un doing the rubbish they have told pts ! ps alcohol pushes up TG levels – seen it happen so many times! Ah great, you’ve been on the Diabetes forum! So you’ll know the kind of advice that I mention in these blogs! Nurses, dietitians, Drs and perhaps even nutritionists telling diabetics to stay away from the ‘evil low carb diets’. The same information that the NHS Choices website is pushing… you’ll have seen the hundreds of case studies of upset patients because of the advice they have been given by their HCP. Don’t jump to conclusions, I”m not saying EVERY HCP is bad…. I have no particular issue with dietitians… only bad dietitians. The same as I have an issue with anyone in the health profession that doesn’t do their own research but instead spouts terrible outdated information. I have good friends and colleagues that are dietitians. If you read round the site you will see me refer to good AND bad practitioners. You sound like you have been very lucky in the places you have worked! Unfortunately, its not all as rosey as your experiences. If you are constantly researching the subject then I am sure you are a good dietitian and that you agree there is too much scare mongering around, cholesterol, saturated fat and lower carbohydrate diets. Doctors unfortunately do NOT stick to being doctors but at least we can agree on what they should do!! That’s part of the goal of Move. Eat. Treat. to give them a basic understanding of now activity and nutrition can benefit health. p.s. I know what alcohol does…. still don’t see your point in relation to this study. oh and ps – the plate is not set in stone but if you use it properly it can generate alot of discussion. There are so many people who have no understanding of food , don’t even know what pro, carbs are so it can be used in a very basic way. I suppose really the type of people who contact you are very different ! I am not an angry dietitian by the way just fed up with people writing mis information about dietitians. albert, you do sound a tad angry 🙂 I hope you’ve signed the Move.Eat.Treat petition already? I can tell you first hand what good diet is. From being 18.5 stone last August with a BMI of 37 to now being 11 stone with a BMI of 25, I have spent a vast amount of time listening to some very knowledgeable nutritionists and doing research of my own. I have also listened to dieticians who generally quote the food pyramid and give bad nutrition advice some of which I’ve paid for myself. I know there is good and bad in every profession, but in all honesty I’m looking to do a nutrition course or two myself now and I’d so like to get to the correct information before I start, so it’s not all a waste of time and effort further down the line. Listening to the likes of Martin MacDonald, Matt Lovell & Ben Coomber have helped me to get where I am today. The results really do speak for themselves. Martin – if you are so keen on research, perhaps you should select quality studies to blog about rather than the poor one you selected here. Plenty of good AND bad studies critiqued 🙂 This post has received so much attention maybe I should be focusing on these types of studies all the time!! Hi Stacey, Fruit contains carbohydrate yes. Increasing antioxidant levels due to eating more fruit and veg is probably a good thing. Sorry this wasn’t clear. We wouldn’t recommend HUGE intakes of fruit. Emphasise veg over fruit. Post away! Albert – Thanks for your comment! Although ‘wannabe celebrity’?? That’s harsh… there was me thinking I already was one! Ouch… 😉 You’re right, it doesn’t tell you much after 4 weeks. I’m not sure what your point is. The authors did a 4 week study to see what happened to markers of risk. Fairly transparent. Have you read the full paper? I can send it to you if you would like? They talk about alcohol consumption etc. I’m not entirely sure what difference this would make though unless you think the dietitans were telling them to drink lots of alcohol to increase their carbohydrate intake?? You’re completely right, my MSc doesn’t teach anything about how to keep people healthy… neither does a medical degree but I’m pretty sure Doctors give nutrition and health advice… and dietetics… well, we’ll leave it there. Needless to say a lot of what I do is self taught and so far the results seem to be doing the talking. I’m not sure where I’m telling HCPs what to do in this post though? Ah great, you’ve been on the Diabetes forum! So you’ll know the kind of advice that I mention in these blogs! Nurses, dietitians, Drs and perhaps even nutritionists telling diabetics to stay away from the ‘evil low carb diets’. The same information that the NHS Choices website is pushing… you’ll have seen the hundreds of case studies of upset patients because of the advice they have been given by their HCP. Don’t jump to conclusions, I”m not saying EVERY HCP is bad…. I have no particular issue with dietitians… only bad dietitians. The same as I have an issue with anyone in the health profession that doesn’t do their own research but instead spouts terrible outdated information. I have good friends and colleagues that are dietitians. If you read round the site you will see me refer to good AND bad practitioners. You sound like you have been very lucky in the places you have worked! Unfortunately, its not all as rosey as your experiences. If you are constantly researching the subject then I am sure you are a good dietitian and that you agree there is too much scare mongering around, cholesterol, saturated fat and lower carbohydrate diets. Perhaps you’re letting your personal feelings towards Harcombe/Briffa cloud your judgement. Do you believe there is NO merit in their work? You believe all dietitans give good information? If you sent 100s of Twitter messages to me and I’d written a book I’ll tell you to do the same! 😉 Doctors unfortunately do NOT stick to being doctors but at least we can agree on what they should do!! That’s part of the goal of Move. Eat. Treat. to give them a basic understanding of now activity and nutrition can benefit health. p.s. I know what alcohol does…. still don’t see your point in relation to this study.